A joint in a mammalian body, is an arrangement of mostly two bones, working together for a particular movement to take place. Being classified according to the amount of movement they permit, they can be fixed type, which is immovable, like skull joints. Others can show movement up to an extent. A saddle joint is a synovial joint having a saddle-shaped articular surface which is concave, saddle-shaped in one bone and convex on the complementary bone so as to allow movement in multiple directions. They give more stability to the bones and are more flexible than other joints like the hinge joint and the gliding joint. Similar to a condyloid joint, the bone riding the saddle (complementary bone) can move about an oval area providing more movement. What are the Best Examples of Saddle Joint? Following are some of the few examples of saddle joint in the human body. 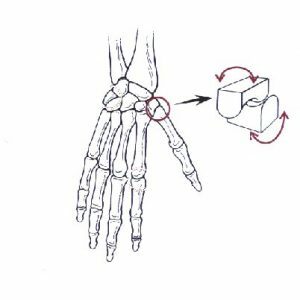 Carpometacarpal joint– The best-known example of the saddle joint is the carpometacarpal joint of the thumb formed by trapezium bone sitting on the first metacarpal. This carpometacarpal joint of the human thumb makes it opposable and allows it to span across the palm and contact the other four fingers. With the help of this joint, the most important human trait of gripping objects and making tools was possible. Sternoclavicular Joint: Also known as the “double plane joint” is mostly doubted to be a saddle type joint. It lies between the clavicle and the manubrium bone of the sternum or the tie bone. The joint is made up of the sternal end of the clavicle, manubrium of the sternum and a part of the first costal cartilage of the costal muscles in the rib cage. Flexion: This is a bending movement to lower the angle between the ports and bring the parts together. Example, closing the grip. Extension: In this movement, the angle is increased and the part is moved away from the rest of the parts. Example, opening the grip. Abduction: Movement away from the midline. Example, spreading the digit apart from the hand. Adduction: This motion pulls the part towards the midline of the limb. Example, bringing the digits of the hand together to create a contact. Circumduction: The conical movement offered by the joint performed by a combination of all the above movements. The joint is held together with the help of 3 ligaments namely, lateral, posterior (dorsal) and anterior (palmar). The lateral ligament runs lateral to the trapezium towards the radial side of the metacarpal base. The Anterior and Posterior ligaments cover the ulnar side of the metacarpal base from palmar and dorsal surfaces of the trapezium bone, respectively. A strong fibrous capsule, providing high stability to the joint, is also present. It is the membrane which lines the joint capsule to keep the bones separated from it. The radial artery and its dorsal metacarpal branch supply blood to this joint. Articular twigs arising from posterior interosseous nerve provide control and coordination. Surfaces are covered with fibrocartilage, and not a hyaline cartilage, which is a general characteristic of the synovial joints. Also, a fibrocartilaginous articular disc separated the two areas. The capsule is made up of 2 layers. Outer fibrous layer – extends from the sternal end epiphysis of the clavicle to the articular surface. Inner synovial layer – lines the inner surface, produces synovial fluid and protects the joint by reducing friction. Following are the four major ligaments that aid in providing stability to the joint. Sternoclavicular ligament – both anterior and posterior bands strengthen the joint from both sides. Interclavicular ligament – spread over the gap between sternal ends and their respective clavicles, it functions to strengthen the capsule. Costoclavicular ligament – bind the joint at the first rib and cartilage inferiorly and to the posterior and anterior sides of the clavicle superiorly. Neurovascular Supply – The internal thoracic artery and the suprascapular artery supply blood to the joint. The joint is enervated by the medial supraclavicular nerve and nerve to subclavius. 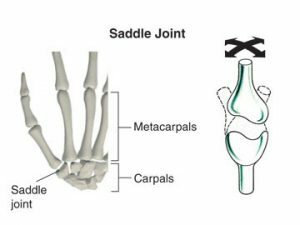 The carpometacarpal joint, being the only saddle joint in the human body, lays the posterior to the thumb. The reciprocally placed concave-convex surfaces of both the bones provide a harmonious motion, together. This results in a variety of movements, for which the opposable thumb is known. Its function in the sternoclavicular joint is unclear. The most common form of arthritis taking place in the arm region is in the carpometacarpal joint. It can also be referred to as basal joint arthritis. The thumb accounts for the majority of hand functions because of its opposable nature. Subjecting to a large amount of force applied during grasping, pinching and grabbing activities, thumb arthritis is a common complication. Initial signs include pain and swelling in the thumb and around the wrist. Holding or pinching becomes painful. The base of the thumb may enlarge and look out of place. Stiffness, redness, and edema may occur depending on the severity of the condition. Thumb arthritis is more commonly seen in females above the age of 40 owing to the condition of osteoporosis. Other causes may include ligament laxity, prior injury or fracture, bone deformity and repetitive workload on the joint. Owing to repeated wear and tear, called the Degenerative Arthritis or Osteoarthritis, the median cartilage becomes thin and synovial fluid reduces leading to bone-to-bone contact and friction which, in turn, triggers inflammation. There can be a different mode of treatment depending upon the severity of arthritis and the stage it has reached. Heat and Ice – hot and cold shocks given to ease muscle stiffness and reduce swelling, respectively, by soaking in warm water and applying ice packs, especially after a heavy activity is the best home remedy. Modification in Activity – activity modifications may help ease of pain and discomfort. Counter drugs – using anti-inflammatory drugs to subside pain and swelling is a temporary solution. Splints and Braces – these are made up of elastic fabric or plastic frames to keep the joint immobile so as to ease-off pain. Cortisone Injections – in severe unbearable conditions, the medical practitioner may apply cortisones in the basal area of the thumb which can relieve pain for a few months. Surgery – a number of surgical options are available for persistent pain and weakness in the joint.